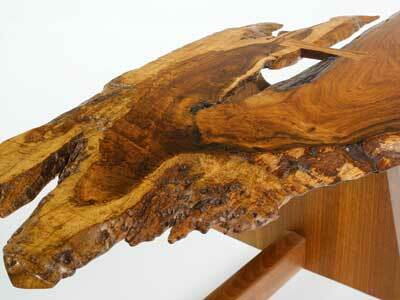 George Nakashima trained and worked as an architect, and in 1952, by which time he had begun making furniture, he was awarded the American Institute of Architects' Gold Craftsmanship Medal. The citation included the words: "You have perpetuated in your work, in your design and making of furniture, the highest standards of past ages of handicrafts, and that respect for good materials and honest labour, that recognition of human use by rich or poor, that will in any age distinguish great craftsmanship; we salute your original and distinguished effort to employ the machine and its resources sincerely, to give our own day beautiful furniture and other objects, by whose standard we will not be ashamed to measure architecture." This award is just one of a gilded list of honours earned by a remarkable man who is descended from the samurai - who used the arts to achieve calm and to occupy free time. He was born in 1905 in Spokane, Washington and was 20 before he made his first visit to Japan, meeting many relatives. He graduated as an architect from the University of Washington, Seattle, sold his car to buy a round-the-world tramp steamship ticket and in 1933-34 sampled the Bohemian life in Paris before joining Antonin Raymond's architectural firm in Tokyo - Raymond collaborated with fellow architect Frank Lloyd Wright. The turning point came in 1937 when Nakashima began a three-year stint at the ashram of Sri Aurobindo in Pondicherry, India as architectural representative of Raymond's office with the task of designing and building a dormitory. He came to be a disciple of Sri Aurobindo who gave him the Sanskrit name Sundarananda (One who delights in beauty). 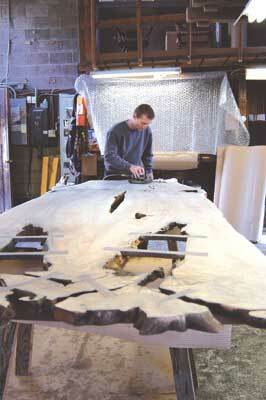 It was here that he made his first furniture. The adventurer returned to Japan via China in 1939 on one of the last Japanese refugee ships after the outbreak of war in China and for six months helped a friend with architectural projects. It was there that he met his wife Marion. Each returned to the States as the political situation worsened and they were married in 1941. 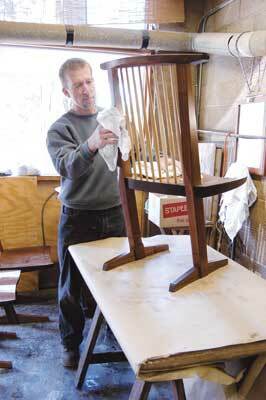 At this time Nakashima began making furniture in the basement of Maryknoll Boys Club in Seattle but hardly had he got started than the US demands of the Pacific War saw Nakashima, Marion and baby Mira - their son, Kevin, was born in 1954 - interned at a camp in Idaho in 1942. 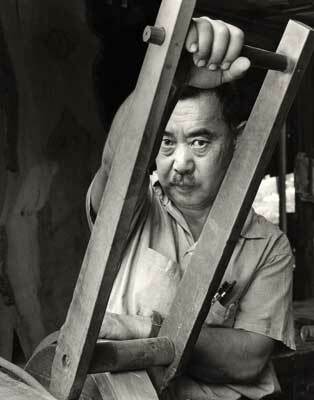 There, under the tutelage of Gentaro Hikogawa, who was trained in Japanese carpentry, Nakashima mastered traditional Japanese hand tools and joinery techniques, and strove for the perfection that is a mark of Japanese craft. 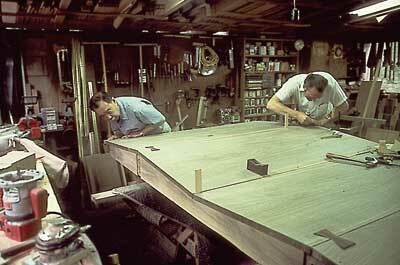 Salvation came in 1943 with the intercession and sponsorship of Raymond, and Nakashima was able to start practising these skills on Raymond's farm in New Hope, Pennsylvania, subsequently renting a small house and then buying a parcel of land just outside New Hope where he designed and built the workshop and house which is still producing furniture by his techniques today, administered by his daughter Mira. There he thought about ways of using timber organically and deliberately chose boards with knots, burrs and figured grain. He designed furniture lines for Knoll and Widdicomb-Mueller while continuing his private commissions, and the studio continued to grow in importance, so much so that in 1973 Nelson Rockefeller commissioned about 175 pieces for his house in Pocantico Hills, NY. His style, a mix of Japanese, American and International Modern, is seen in a body of work that was to win him major awards in Japan and the US. His major commissions also included interiors for Columbia University, the Church of Christ the King in Katsura, Kyoto, the International Paper Corporation and the Monastery of Christ in the Desert. 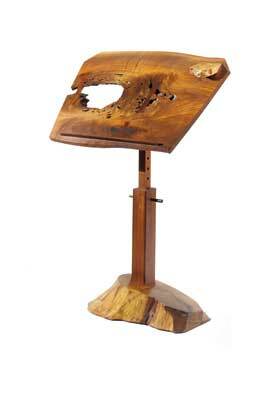 In the 1960s he began teaching his own integrated woodworking methods by designing and consulting for workshops in Ahmedabad, India and Takamatsu, Japan. His last show in the US, the retrospective Full Circle, which opened at the American Craft Museum in New York, marked him as a Living Treasure. This show returned to New Hope shortly before Nakashima received his final award, Alumnus Summa Laude Dignatus, from the University of Washington, one week prior to his death in June 1990. 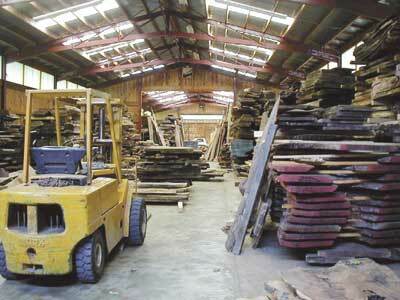 The business is now in the hands of Nakashima's daughter Mira. 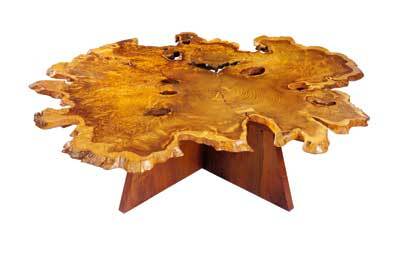 A studio and showroom are open to individuals on Saturday afternoons and in addition group tours of 10 or more can be arranged, with a $15 donation to the Nakashima Foundation for Peace. The property houses 14 buildings, eight of which can be seen. Among them is the Minguren Museum with its plywood hyperbolic paraboloid shell, illustrating Nakashima's fascination with thin-shell construction. 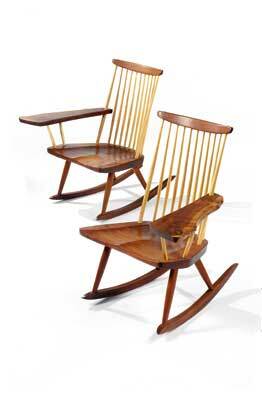 "He designed furniture lines for Knoll and Widdicomb-Mueller while continuing his private commissions"
Dr Arthur and Mrs Evelyn Krosnick collected Nakashima furniture for 30 years, though sadly more than 100 pieces were lost to calamitous fire in 1989. 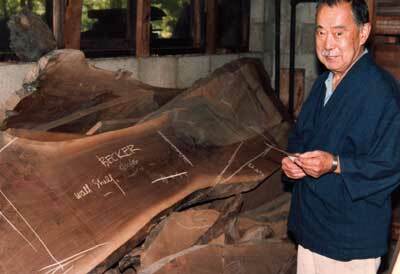 Nakashima, then 84-years-old and relying on his daughter Mira to assist him with the management of the workshops, agreed to execute the new designs and to oversee the making of new pieces. He is quoted in the New York Times as saying: "The new pieces... will be as good, if not better, than the destroyed ones." 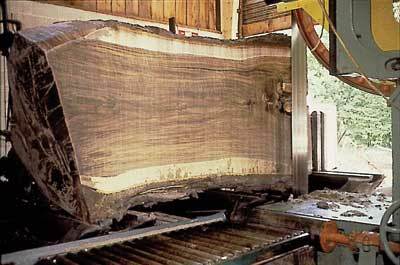 In fact they are widely thought to be even better, reflecting the availability of a greater variety of woods which allowed him to choose timber with more dramatic graining and colour. 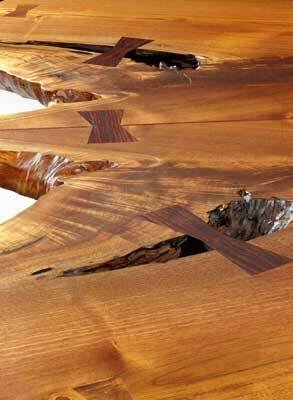 This time he elected to retain larger amounts of the natural edge of large cuts of timber, and embellished his designs with a more emphatic use of butterfly joints, placed for both aesthetic reasons and for stability.